There are several kinds of marijuana concentrates that people use for its potency and also for medical and recreational purposes. Some of these forms of marijuana concentrates are hash oil, wax, shatter, bubble hash, dust, dab and ice wax. These are made using various kinds of extraction methods, but mostly butane extraction or BHO (butane hash oil). Rosin tech is one of the easiest and cheapest ways to wax marijuana while at home. This method is easily learned when you become a student at the Cannabis Training University. Now, let us look at the types of marijuana concentrates that are on the market these days. One of the marijuana concentrates that is popular on the market is glass extracts or what is known as shatter. The reason it is called glass is due to its transparency. It is clear and light, but packs a good punch. You have to heat it well to get that kind of potency. Kief, also known as Dust is another concentrate that is made with dry ice as one of the ingredients in the extraction process. It has a consistent grainy appearance, but easily thawed. This could be the alternative to the marijuana joint. Rosin is another form of marijuana concentrate that is prepared using the rosin tech process. The marijuana concentrates collected comes from the stains that are produced from this process. You can smoke this in your joint. Budder is one of the marijuana concentrates that looks like butter, but not just any butter – peanut butter. The butane extraction method is used in this case and you can use it with all smoking methods. Dab or wax is a very popular concentrate that has the appearance of ear wax or bees wax. Dab oil or hash oil is also popular, but it is more potent and can be used in a vaporizer. Some people include hash oil in their edibles for rich potency. Bubble or ice dabs is considered one of the safest and purest forms of marijuana concentrates. Cold water is used to extract it to prevent exposure to possible contaminants. Its appearance is like sand! However, you can consume it in different ways. Scissor is one of the marijuana concentrates that is not as popular, but just as good as the rest. The process involves the cutting and handling of the cannabis leaves. The sticky substance that is extracted tends to be highly concentrated in cannabinoids. 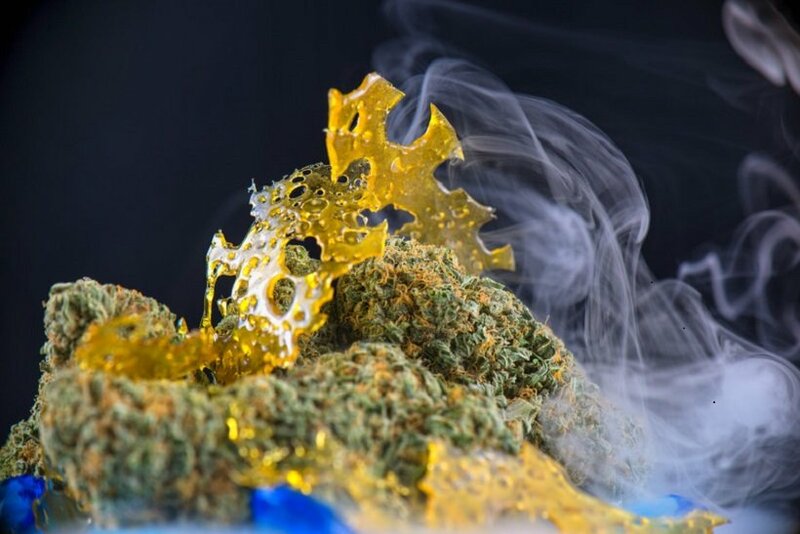 Now, let us look at ways that these marijuana concentrates can be smoked. Using an oil rig, you will be able to smoke the wax dabs that you have extracted. What is this oil rig? Well, it is a water pipe that you can modify adding certain accessories, but in most cases, you would add a nail. The quartz or titanium nail would be attached to the water pipe’s intake. Other items needed to use an oil rig are a torch, carb cap, and dab oil or shatter. Fill up the water pipe with sufficient water and then attach the nail to the pipe’s intake. Use the torch on the quartz or titanium nail, heating it until it is red hot. Try not to overheat or the nail will be damaged. As soon as the nail is sufficiently heated, it is time to place a small dab onto the end of your carb cap, dabbing it onto your nail and making sure that you do not use any of the dab to cover up the hole of the intake or it will blow up on impact. For a good dab hit, you only need a small amount of dab because of its heavy concentration. If you want to know more about other marijuana concentrates, check out the Cannabis Training University where you can enroll as a student!